If we knew exactly what causes pimples a cure would be right around the corner, right? Well, when it comes to acne and causes, it’s not so simple. Many factors including heredity, hormones, bacteria, and even diet contribute to pimples but none causes pimples alone. 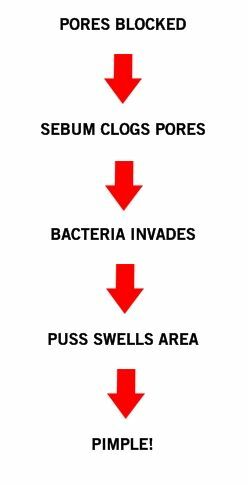 Let’s look at exactly what happens to form a pimple. It’s not as complicated as it seems so stay with me! Our bodies, including our faces, backs and chests, are covered in tiny hair follicles. Each follicle contains a sebaceous gland which produces an oily substance called sebum. At puberty hormones cause the amount of sebum produced by the glands to explode, especially in men. Sebum production tapers off as we get older. Now normally, this sebum comes to the surface of the hair follicle where it coats and protects our hair and skin. But if the pores on the skin surface get blocked, the sebum clogs and builds up, causing blackheads and whiteheads. Bacteria then invades the area, feeding on the sebum and making things worse. Our bodies fight the bacteria with white blood cells which, as they die off, form puss. The puss builds up, swelling the area, and Congratulations, you have a pimple! At this stage the pimple can develop further into cysts and nodules that go deep into the skin and can be quite painful and even lead to scars. That’s kind of the mechanics of how a pimple is formed and you need to understand it to be able to treat and prevent pimples effectively. So what blocks the pores in the first place? It’s not dirt. Don’t listen to people that tell you that poor hygiene is what causes pimples. It’s simply not true. That black you see on blackheads is actually melanin – a natural component of skin. That’s why you can clean your face as much as you want and what you’ll find is that it just aggravates your acne and causes it to get worse. So maybe you should tell them that too much hygiene is more of a problem! The real problem is inside your pores, not on the surface of the skin. The culprit is dead skin cells within the hair follicles. Normally, when individual skin cells die off (a normal natural process) the dead skin cells clear out of the follicle and are shed off of our bodies. But in acne sufferers the dead cells don’t clear out properly. They tend to ”slough off” in sheets instead of as individual dead cells. Sheets become clumps and clumps, unfortunately, don’t clear out of the follicles as easily as single cells. Why the process is different in acne sufferers is not well known. In theory, keratin (a natural protein of the skin) is over-produced in these acne-prone hair follicles and keratin plays a key role in binding the dead cells together in clumps that plug the follicle pores. This keratin over-production is caused by androgen hormone levels and those hormone levels are probably hereditary – it’s in your genes. If your parents had acne, you may have inherited it from them. No traditional medical treatments specifically target the hormone imbalance that causes the faulty clearing of dead skin cells even though it is one of the root causes of acne. In fact it is the first cause of acne pimples. Instead of dealing with this hormone problem which leads to blocked pores, traditional medicine concentrates on fighting bacteria (a much later-stage problem) and reducing sebum production with the use of vitamin A derivatives called retinoids (isotretinion – Accutane) and, in women, birth control pills. Let’s take a look at the fairly obvious shortfalls of targeting bacteria, first. Propionibacterium acnes (P. acnes) is fought with topical agents such as benzoyl peroxide and antibiotic chemicals, and with oral antibiotics. Many doctors still assume that what causes acne pimples is bacteria (P. acnes) but in fact it is possible to have pimples develop without the involvement of bacteria. As we’ve seen in the development of a pimple, the bacteria only invades the area after the pore is blocked and the sebum backs up. This is one reason why targeting bacteria by slapping loads of creams and gels on your face is seldom effective and mostly a waste of time unless you have very light acne and can live with blackheads and whiteheads.